For years I’ve said that the enshrinement of San Francisco’s favourite son Francis Joseph “Lefty” O’Doul at Cooperstown is overdue. Sure, we in San Francisco named a drawbridge after him — but Lefty is due some recognition at a national level. “For one thing, Lefty finished up with a career Major League batting average of .349. If you’re not a connoisseur of baseball numerology, that number is almost unbelievably good. In the history of major league baseball only three other players have ended with higher lifetime averages, each a legendary figure: Ty Cobb, Rogers Hornsby, and Shoeless Joe Jackson. And of the 66 batters already in the Hall of Fame, Lefty’s number is better than 64 of them. But numbers have an almost fetishistic value in baseball, and had he gotten just two more hits in his peak 1929 season, his average of that year would have jumped from .398 to the magical .400 — and the whole baseball world would remember his name. But numbers aside, Lefty could be honored for his work promoting the international game alone. In 1964 the San Francisco Giants signed Masanori Murakami as the first Japanese player in the American big leagues. There are many more playing here today — Ichiro Suzuki, Hideki Matsui, and Daisuke Matsusawa to name just a few — and frankly, without Lefty’s contribution none of that would have happened. Convinced? Now’s your chance to cast a vote! Did I say “cast” a vote? What I meant was “lean on the folks who actually get to”. Tom O’Doul (the last name’s no coincidence, he’s Lefty’s cousin) is spearheading a letter-writing campaign to get the slugger into the Hall — as a recipient of the Buck O’Neil “Lifetime Achievement Award”. An email from Tom showed up this afternoon, and he’s enthusiastically granted me permission to reprint it on Sparkletack. The time has come to start a letter writing campaign to the National Baseball Hall of Fame and Museum and put “Lefty” into the hall. The Buck O’Neil Award is to be awarded to persons who were ambassadors to the game and have promoted the game over their lifetime. Francis Joseph “Lefty” O’Doul was one of those pioneers and a true ambassador to the game. What he did for baseball in Japan, qualified him for induction into the Japan Baseball Hall of Fame and Museum in 2002. What he did for baseball on the West Coast, qualified him for induction into both the Bay Area Sports Hall of Fame and the Pacific Coast League Hall of Fame. No one is more deserving to be recognized as an ambassador to baseball than Francis Joseph “Lefty” O’Doul. He deserves to receive the Buck O’Neil Award. The award will be announced in 2011. But, now is the time to start writing letters. Great website and podcasts! 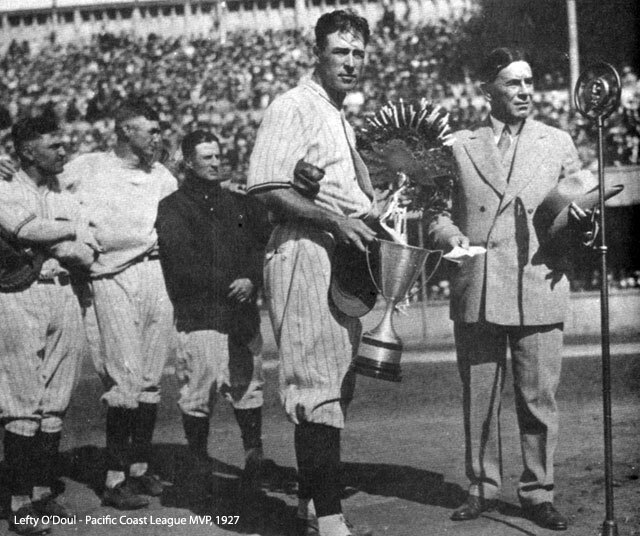 Always loved basball and San Francisco, hence there was/is a place in my heart for Lefty O’Doul. I wrote my letter to the Baseball HOF. Here’s hoping they do the right thing. As a pure fan of the game, I can really appreciate everything Left accomplished. He was one of the true work horses of that era. I am going to start sending letters to help get the recognition he deserves. did you see the piece in the Chron about the return of Lefty’s “arm” being returned to the restaurant. I am going to try to place that around with some baseball writers. That’s a terrific story! For anyone who missed it, here’s the Chron’s write-up. Hey Richard, great find and an honorable mission to get him into the hall of fame. Now that more than one year has passed, how had this been planning out?